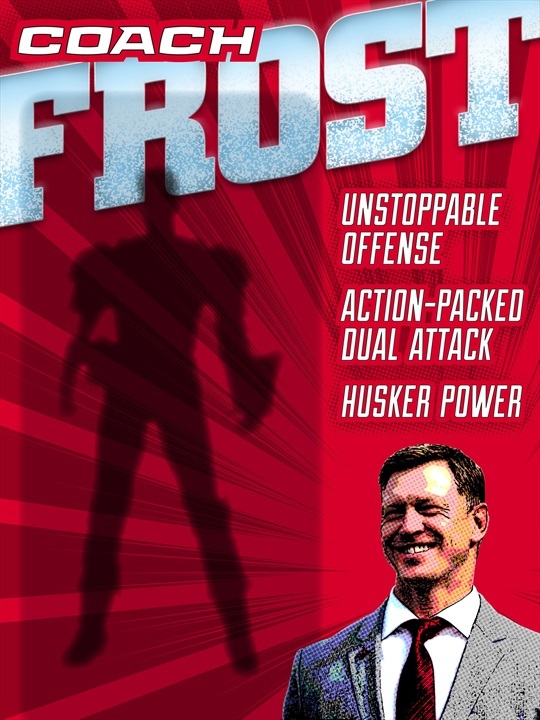 As it became increasingly apparent that Nebraska Athletic Director Bill Moos was going to hire former Husker quarterback Scott Frost as the football team’s next coach, the Hail Varsity team started planning how to put Frost on the next issue’s cover. The first plan was to shoot a portrait of Frost in his new Nebraska gear with the stadium in the background. With only one week between the announcement of the hiring and our print deadline, we thought odds were 50/50 of getting one-on-one access with the very busy new coach. We needed a backup plan. I’d seen an ESPN magazine cover recently that I liked conceptually. For their issue that hit newsstands around Thanksgiving, they created a photoillustration of Eagles quarterback Carson Wentz as a larger-than-life float in a parade. 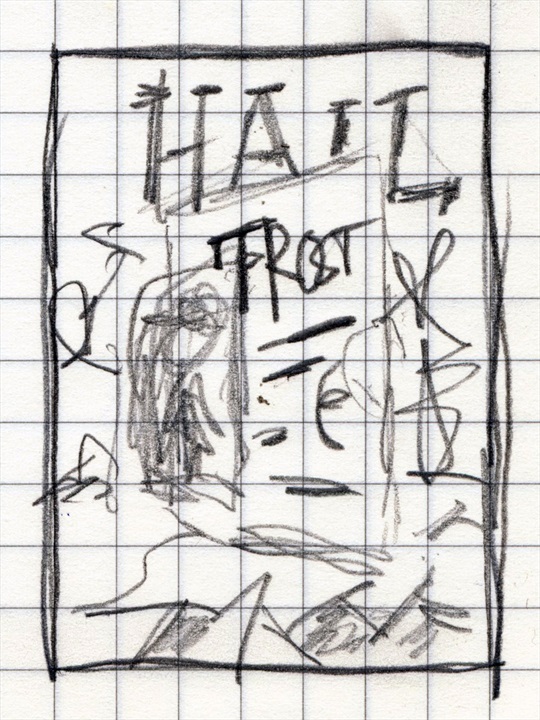 I began thinking of ways to put Frost on a conceptual Hail Varsity cover without having access to shooting a unique portrait of him. I wanted to merge the two feelings Husker Nation had about the hire: Scott Frost is a superhero (see his 12-0 record this season at Central Florida) and Scott Frost is the Christmas gift all Nebraska fans wanted this year (see every letter addressed to the North Pole with a Nebraska postmark this year). 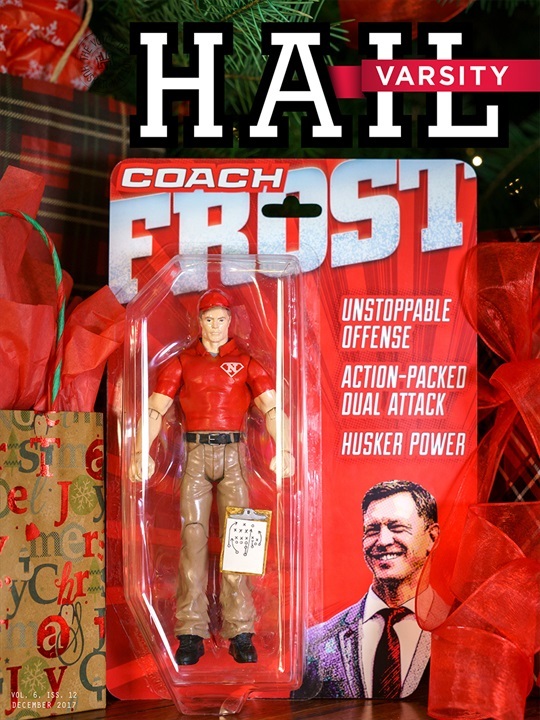 Mash the two together, and a freshly unwrapped Coach Frost action figure seemed to fit the mold. So I drew a thumbnail of the concept. Now we had an idea and a week. We had to start executing. I called my very talented friend, Omaha illustrator Tim Mayer. As someone who draws them for a living, I thought he may have some good advice on how to make a superhero. He floated the idea of 3D printing, which sounded awesome but seemed liked it would take more than the one week we had. We decided not to reinvent the wheel, and we hit the toy aisles of big box stores to look for inspiration and, with some luck, a model that could transform into Frost. Tim initially looked at a 24-inch tall Superman figure. Frost has the figure of a man who may duck into phonebooths in the event of trouble, but this one was too big for our needs. We wanted a classic-sized figure, in a plastic and cardboard case. We looked at smaller superheroes like The Hulk and The Flash, and other versions of Superman. They were all too strong and bulky or had emblems embossed in the plastic of their uniforms. 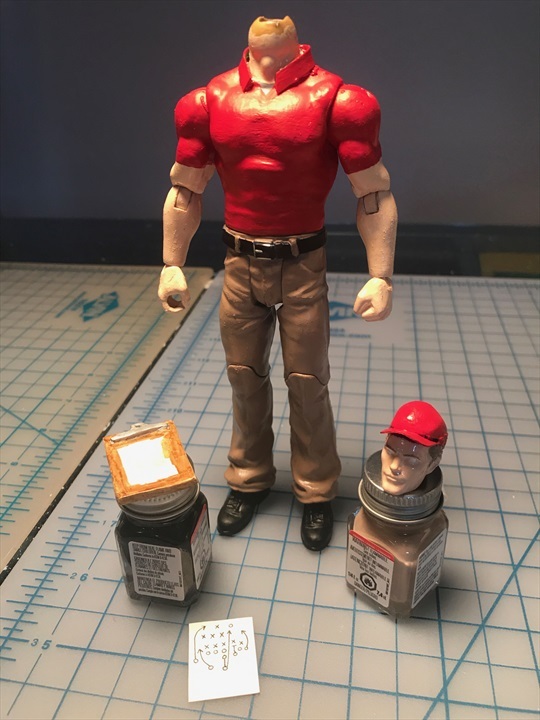 We needed to find an earthly superhero, one who wore khakis and didn’t have a logo melted into his chest. We needed a WWE wrestler. 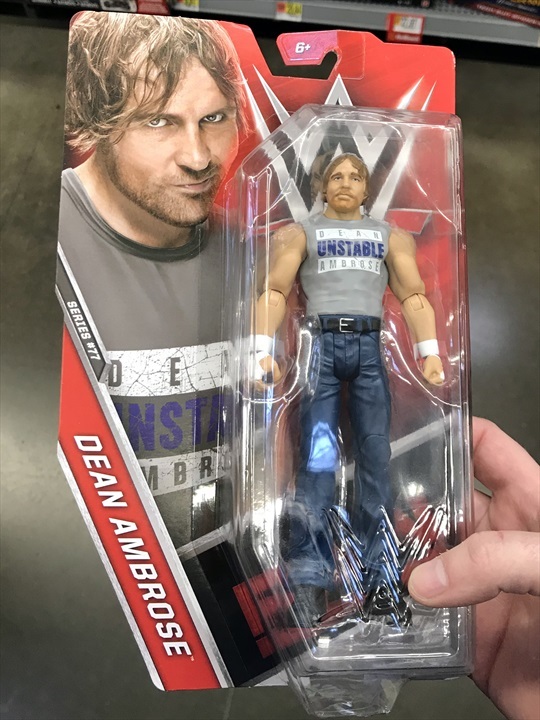 We sifted through stacks of them before finding the perfect guy: Dean Ambrose. He was wearing jeans instead of lycra, shoes instead of rocket packs and his belt didn’t have any grappling hooks or gernades attached. 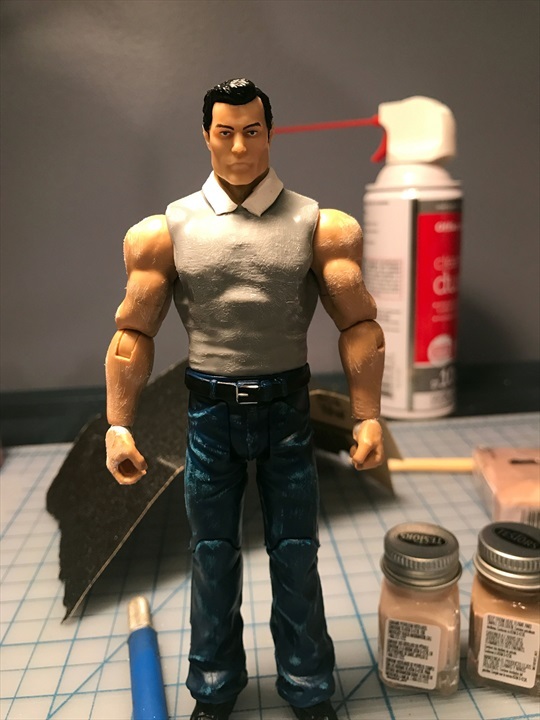 Tim thought his shirt and pants would be easy enough to paint over to transform him into Frost. 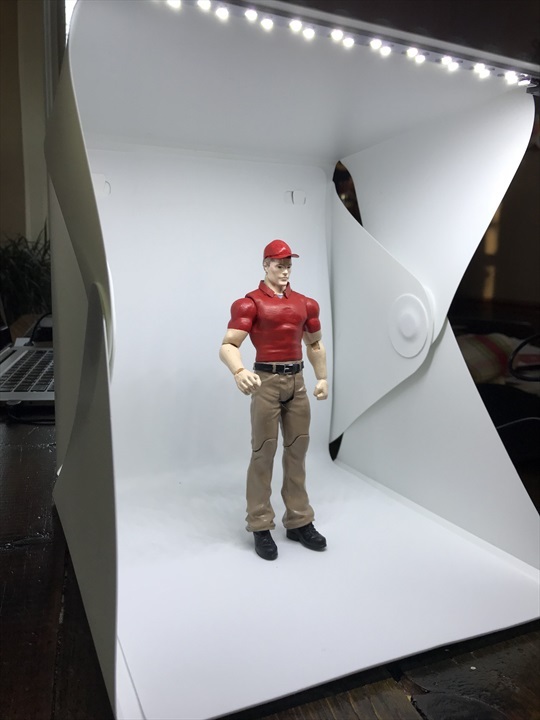 So, Tim got working on the make-over, as I started building some new packaging based on the visual vocabulary of action figure design. Over the course of about 48 hours, it started coming together. 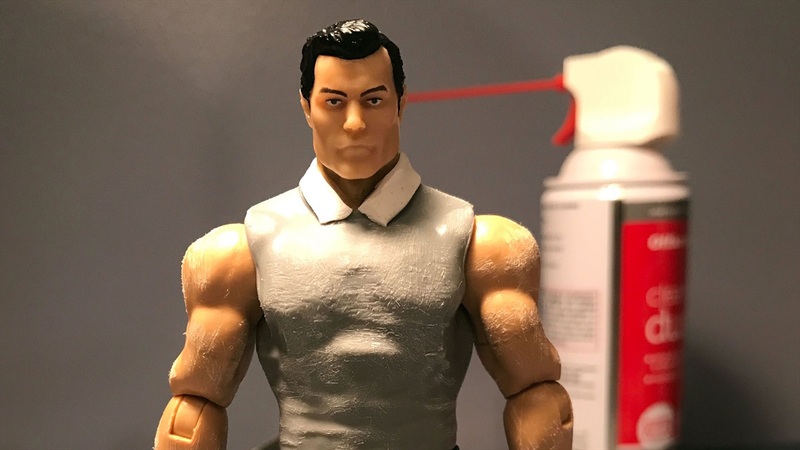 Frost’s hairline is unique to men from the planet Krypton, so poor Dean lost his head to make room for Clark’s. Tim nailed the paint job, and added a hat and clipboard. From there, it was a matter of finding the right setting for the cover photo. 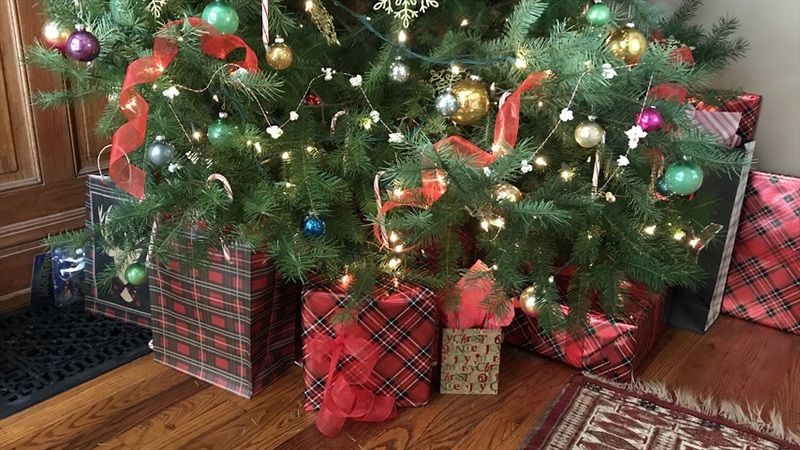 Hail Varsity CEO/founder and photographer Aaron Babcock spotted the perfect spot, under my tree. After we nailed down the cover picture, it was time for Lil’ Frosty to break out of the box and pose for some photos. The final cover, which is on newsstands now.